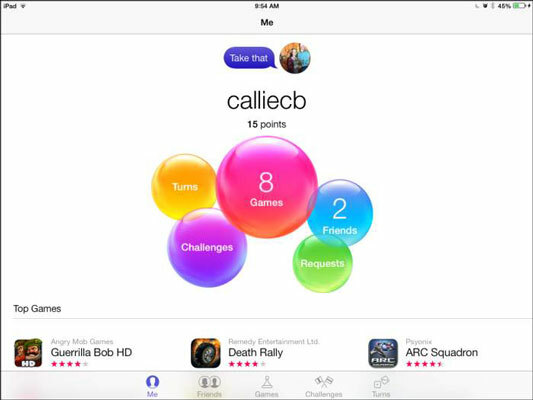 From the Home screen, tap the Game Center icon. If you’ve never used Game Center, you’re asked whether to allow push notifications: If you want to receive these notices alerting you that your friends want to play a game with you, tap OK. You should, however, be aware that push notifications can drain your iPad’s battery more quickly. On the Game Center opening screen, sign in. If you want to use Game Center with another Apple ID, tap Create New Apple ID and follow the onscreen instructions, which ask you to enter your birthdate, agree to terms, choose a security question, and so forth; or enter your current account information and tap Go. The screen that appears once you’ve signed in shows games you’ve downloaded, requests from other players, friends, and so on. Tap any of the floating balloons to get to these categories or tap a button along the bottom of the screen. 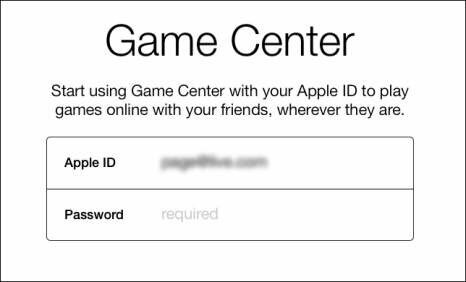 When you first register for Game Center, if you use an e-mail address other than the one associated with your Apple ID, you may have to create a new Apple ID and verify it by responding to an e-mail message that’s sent to your e-mail address.